Vincent van Gogh was born on March, 30th 1853 in a village in the southern Netherlands, to Theodorus van Gogh, a minister of the Dutch Reformed Church and Anna Cornelia Carbentus. Vincent's sister described him as a serious and introspective child. In 1860 Vincent began attending the Zundert village school. He remained there for only one year, and then continued his education in his home with his sister Anna, until he was sent away to boarding school in 1864. In 1866 he began attending middle school in Tilburg, where he was given his first instruction in drawing. Van Gogh spent his young adult life working for art dealers. He also took an interest in the vocation of his father, and became a missionary worker in an impoverished mining region in Belgium in 1879. In the following year Vincent took the suggestion of his brother Theo, and decided to become a painter. After several years of study he completed his first major work, The Potato Eaters (1885). 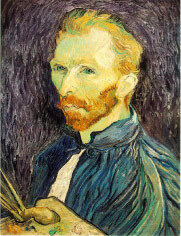 In the beginning, van Gogh limited his color pallet to dark colors. When he encountered Impressionism and Neo-Impressionism in Paris his style changed, incorporating brighter colors and developing a painterly style that was uniquely recognizable. Van Gogh worked hard, and produced more than 2,000 paintings, drawings and sketches in the last ten years of his life. His best-known works were created in the last two years, a time in which he suffered from mental illness which eventually led to his suicide. Vincent van Gogh died on July 29, 1890, having produced some of the best known and most expensive works of art in the world today. His painting The Starry Night (1869) has become one of the most celebrated art masterpieces of all time. Van Gogh pioneered the art movement that came to be known as Expressionism, and dramatically influenced the art of the 20th century, and specifically the Fauves (The Wild Beasts) and German Expressionists. 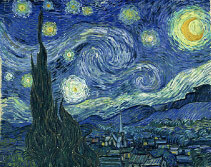 The Starry Night is widely viewed as the greatest of all of Vincent van Gogh's works. The painting is of a scene that he saw from his window. Although it is a nighttime scene, it was painted from memory during the day. Still Life: Vase with Twelve Sunflowers is a painting from a series of two sets of still life paintings. 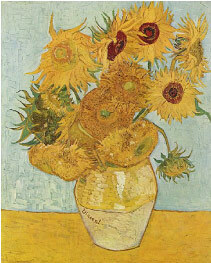 The first series shows sunflowers lying on the ground, while the second set shows them in a vase.